TESDA offers a lot of technical-vocational course that can be the key for an entry-level job both locally and overseas. 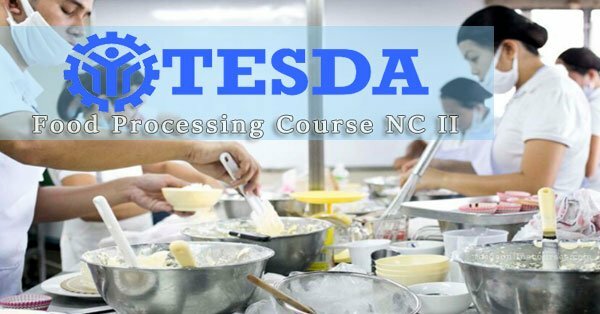 Food processing course is one of the food-related courses offered in many schools accredited by TESDA. This course involves food handling, packaging, and operating common food processing equipment. This short program will let a student know how to practice food safety and sanitation prior of packaging processed or finished food products. Likewise, implementing good manufacturing procedure is also taught along with mathematical procedures as well. Enrolling for food processing course lets you learn more skills aside from occupational health and safety procedures. The short course for food processing NC II takes about 568 hours. The completion time may be shorter, but it is assured that the quality of training is satisfying and guaranteed. Be reminded that before you can enroll for Food Processing NC II, you must first complete the Food Processing NC I. The good thing about taking the prerequisite course is that you will have backgrounds about the basic practical activities. Anyone who is granted with the Food Processing NC II certificate can apply for a job as a production aide, packaging aide, or start his or her own business. However, before the certificate is granted, the student will undergo a Competency Assessment prior to the completion rites. The assessment test is given to determine the competency level of the individual. It is important to pass the assessment test, otherwise all your time, money and effort will be wasted.